"A 3D-printed gun is not potentially dangerous, it is dangerous"
It turns out that at least one of the 100,000 downloads of Defense Distributed's Liberator 3D printed gun blueprints was done by the NSW Police Force, who today confirmed that the technology is dangerous. 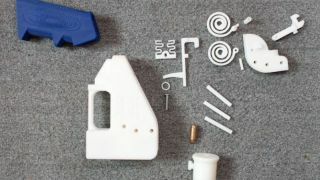 Using a 3D printer acquired for AU$1700 and AU$35 worth of materials, the New South Wales Police Force force printed one Liberator gun to test the legitimacy of the concept. The police constructed the weapon in about 27 hours. In a secure facility it fired the weapon, with the nail used as a firing pin penetrating 17cm into the gelatin block it was fired into. In the department's own words, "This would be more than capable of killiing someone." As much as NSW Police are concerned that people will print the gun as an undetectable weapon for nefarious purposes, they also stress the dangers posed to anyone who prints the weapon themselves out of curiosity. Their concerns are justified, given that their second attempt at firing their printed Liberator saw the weapon explode. "The message goes out to anyone with the resources to purchase a 3D printer. Don't attempt to use a 3D printer to produce a weapon. A 3D-printed gun is not potentially dangerous, it is dangerous," Police Commissioner Andrew Scipione said. The Commissioner also stressed that printing the weapon is very illegal, and that the Police would crack down on anyone printing, selling or owning a 3D gun. "Make no mistake, these things are firearms. You do not need bullets to make it a firearm. It is a firearm. If you produce a firearm using a 3D printer, you are committing at least two crimes: Manufacturing a firearm and possession of an illegal firearm. We will prosecute offenders caught manufacturing, selling, owning or in possession of a 3D gun," Scipione explained.